One of the most difficult people to understand in the alienation drama is the triangulating alienated child. This child is one I have come to know as the proxy alienator, the person through whom the family is controlled or alternatively kept in chaos which in itself is another form of control. Triangles and triangulation is an essential behaviour which anyone facing alienation from a child should know about. Triangulation is the use of a third person not present to strengthen the control a person has over someone else. A good example of triangulation is the use of the parent the child does not live with in a discussion with you about things they are allowed to do at that parent’s home. The purpose of the triangulation of that parent into your discussion is to put pressure upon you to feel inadequate or wrong in some way so that your parenting is undermined and the child gets their own way. Most children of divorce and separation will use triangulation at some point in their lives but the alienated child who uses triangulating behaviours will do so persistently and deliberately as they learn from the alienating parent how to manipulate others into aligning with their world view. There is nothing more terrifying than the prospect of your own beloved child becoming the ‘enemy within’ as you become aware of their capacity for making you feel uneasy and unsafe in your own home. Triangulating alienated children tell lies, sometimes whopping big lies which are easily disproved, at other times subtle lies which layer upon each other to confuse you and leave you feel vaguely unsettled on a permanent basis. I do not mean to make you feel that alienated triangulating children should be blamed or shamed for what they are doing. Blame and shame are not useful tools for these children, boundaries and steadfast addressing of triangulating behaviours are. Alienated children who use triangulating behaviours learn how to do this from the parent who is harming them. What I have come to know about alienated children is that they are often hiding odd behaviours behind an effort to be seen as normal but that in crisis they will reveal these behaviours in unexpected ways. A good example is the way that one child in the family will be targeted by an alienating parent as being special in some way. This child is regarded as a special friend or close confidante who is particularly good at understanding the parent’s needs, this child is relied upon and seen as the second in charge in the family system. The child might be psychologically ‘married’ to the parent they are being influenced by (common with only children who are girls who become pathologically aligned to their father as a response to his incapacity to cope with the loss of the mother) or they may be seen as the solver of the family problems. Whatever role this child plays in the family, the feeling that accompanies their take up of the role is that they are special and powerful and they are equal to or higher than the rejected parent in the family hierarchy. This child is likely to hide their manipulations at first and project blame onto others including siblings AND the parent who is influencing them, but in time they will be revealed as the proxy alienator, the one who is sneaking around behind the scenes stirring the pot and making everyone believe that everyone else is crazy. This child is in extreme danger although they will deny it. They are in danger because they are unwittingly being used as a conduit for the influencing parent’s distorted behaviour patterns. When I am working with a child around whom there is a lot of chaotic events and a lot of distrust and confusion being sown, I know to monitor the patterns of behaviours which are emerging and to begin the process of ‘circling the triangle’ a communications strategy which we use at the Family Separation Clinic to close down triangulating behaviours so that we can settle the foundations of the family ready for therapeutic work. ‘Circling the triangle’ means to bring everyone involved in the family dynamic into the communication circle to prevent triangulation. This is easily done when we are working in court cases by copying everyone involved into every email that is used to convey information and by not using the telephone as means of communication. 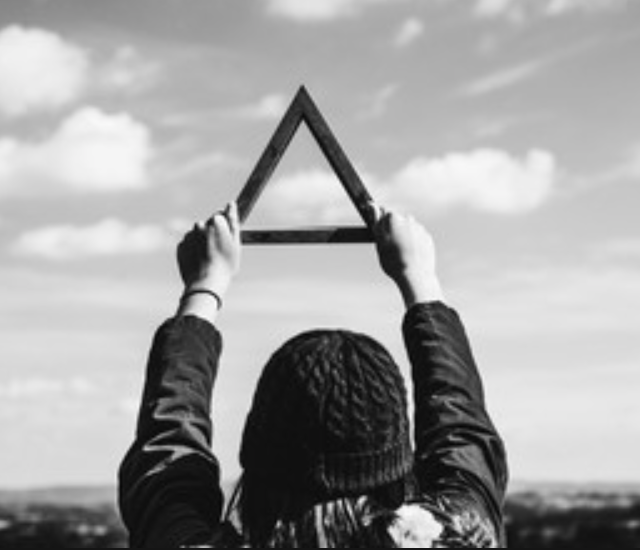 By circling the triangle, it is possible to see who within the family system understands what they are doing and who does not. Circling the triangle is one of our methods of observation of a family in our assessment and therapeutic trial programme. Trialling therapy with a family affected by alienation is a structured intervention which rapidly differentiates a case by documenting maladaptive behaviours, recording patterns of behaviours and testing whether parents can change what they are doing. Within a therapeutic trial we will identify the alienating parent, the children who are being influenced, the resilient children and the proxy alienating children. We will also identify the behaviours which are being used and will then determine whether or not a structured intervention which is underpinned by the Court can create significant change. One of the first behaviours we see is triangulation and one of the first to be observed using that behaviour is the child. A child who is alienated is a child who uses splitting as a maladaptive coping defence. Triangulating behaviour is the maladaptive behaviour which emerges from the splitting defence alongside other behaviours such as entitlement and lack of empathy. A child who is completely alienated will not see a parent at all but some children who are mildly or moderately alienated will continue to see a parent but instead of using splitting, will use switching behaviours instead. Switching behaviours are when a child shifts position in each household and appears to aligns to each parent in turn although in reality it is my experience that there is always the primary pathological alignment in play in these circumstances. What happens when a child is using switching behaviours is that a parent is led to believe that a child is reporting to them genuine dissatisfaction with the other parent when in fact what they are doing is using triangulating behaviours to manipulate a parent into sharing information or to maintain their position as either equal to or above that parent. What emerges around this child are often chaotic events which cause conflict with other people getting the blame. By the time you finally realise that the child you felt was trying to find their way to you, was actually using a devious seeming behind the scenes strategy, it is often too late and much damage has been done. You can help the child who switches and triangulates by teaching them that you do not use those strategies yourself. When your child says to you ‘daddy thinks you are….’ or ‘mum says you are …..’ your response should not be tell me more I am so glad you are telling me this, it should be why do you think I need to know what daddy is saying about me, how do you think that might make me feel? In responding this way you are making the child face the reality of what triangulating behaviours do to people. When you tell me unpleasant things that your mom is saying about me it makes me feel uncomfortable because she is not here and I do not know whether what you are saying is true, you are circling the triangle and teaching the child that regardless of what mom or dad says, you don’t want to take part in that game. It shuts the triangle down and prevents the child from wielding power. It also closes down any deliberate use of the child as a conduit to destabilise you by their other parent. Our aim here is to keep the focus of the relationship between you and the child upon your role as teacher of empathy and compassion. When that role is protected and you refuse to be part of the dysfunctional dance you are better protected and better able to protect your child from the harm that triangulation does. In our work we teach parents to determine what is being done by paying attention to how they feel inside on a moment by moment basis. Triangulation makes you feel uneasy, I call it living in the house of creeping dread. It is ever present in alienation and in its worst forms it causes severe and prolonged webs of lies which become embedded in the foundations of the broken family structure. And at the heart of that fractured and fragmented past will often be the alienated triangulated child, sometimes now an adult and always deeply affected by the maladapted role and disproportionate power they have held in the war which led the family to alienation. I see them often in my practice, they have no idea what is wrong with them and they spend a whole lot of their time blaming and shaming others for the perceived wrongs done to them. Suffer the triangulating children, they are ripe pickings for others who manipulate in similar ways. I call them the messenger children, they tell us what is wrong in the family line. When we see them we circle them, join up the dots and prevent them from being in control, that way we can show them that their childhood has been stolen and teach them how to retrieve it. We are changing the future by encircling the present with love instead of fear. Embracing freedom instead of a life lived within the bars of control. Which is what every child in the world deserves. We have a new Therapeutic Parenting Course for 2019 which uses all of the techniques we teach to parents of alienated children we are working with in the court process. I will be announcing this and other trainings here shortly. Karen, interesting that you equate triangulated children with girls who adapt pathologically with a father who cannot cope with the loss of her mother – I can see that happening. Is it your experience, that a similar effect happens with an older boy & the mother in a acrimonious split between parents? That is, the mother is unable to cope with the loss and the older boy becomes her saviour/succourer? Would like more info and notifications on the upcoming 2019 training for target parents dealing alienated children. Very interested in participating in something like this. as to the context in which he said that. I will say, since returning he has not tried to triangulate like he used to, in the sense of saying the “Mom said this” stuff. But he’s still impossible to be around because everything could be a lie, we never know. If I asked him the time, I’d double-check. It’s very sad, and frankly, feels very hopeless. Karen-how long does it take for the proxy child to stop these triangulating behaviors? When do they tire or grow out of it and move on in life? when will the drama, lies and chaos stop? If 15 years have past the child is now an adult of 30 and have their own child, are they conscious of what they have done? You mention in the first paragraph they used those triangulating behaviors persistently and deliberately. How do they feel after they have learned what they have done to their parent? I have a 30-year-old son who was alienated from me by his father. In his late teens, and until his mid-twenties (after his father had moved out-of-state), he entered into a relationship with me that was more loving and respectful. Unfortunately, in his mid-twenties he met, became engaged, and had a daughter with a very troubled young woman who suffers from paranoia and a lack of empathy. Just before my son and his fiance moved out-of-state, his fiance misrepresented something I told her which led to a year and a half estrangement from him. My son and I began communicating again after a year and a half. For the next several years he complained of being unhappy and wanting to leave her, yet he seemed afraid that leaving her would result in losing custody of his daughter. I remained in contact with him for the next 4 years, yet I didn’t see him during that time or meet his daughter. Recently my son told me that he was going to try to make it work with her. It was also at that time that he began reverting to the behaviors I had seen during his father’s alienation of him from me. We are now in full alienation mode again. I find it interesting that my son’s fiance (now dictating the terms of my relationship with my son and he going along with it) seems to almost exactly mirror the dynamic of his childhood and the parental alienation that occurred then. Yes, the trans-generational march goes on and the risk for alienated children is they will become alienated parents. It was a sad day indeed when I realized I would not trust my own daughters in my house. Another eye opening post Karen…..like others, I wish I’d understood all this years ago…. perhaps life might now be different, in a good way. A number of people above have made interesting comments and raised questions…..but as yet no responses from you….. I for one your would welcome hearing your thoughts. The issue of lies, and tell-tale stories about others, by children, is a nightmare scenario for any parent to find themselves in. How to work out what is truth and what is lies? Lies destroy trust. Suspected lies create suspicion and the creation of emotional barriers between parent and child. As Peter says “It was a sad day indeed when I realized I would not trust my own daughters in my house.”. I know the feeling. The booklet sounds a great idea Karen…..it can’t be easy being in your position. You are only one person and yet so many of us want to ‘pick your brains’ on this dreadful life scenario that is PA and all that it entails. I’m hoping there is light however as cafcass have now recognised this and even said the words this seems very much like parental alienation and will present this concern to the court. Karen I am happy to share my experiences and the progress with you to help the work that you do – I have already utilised the support of your clinic. Let me know if this is of interest to you.